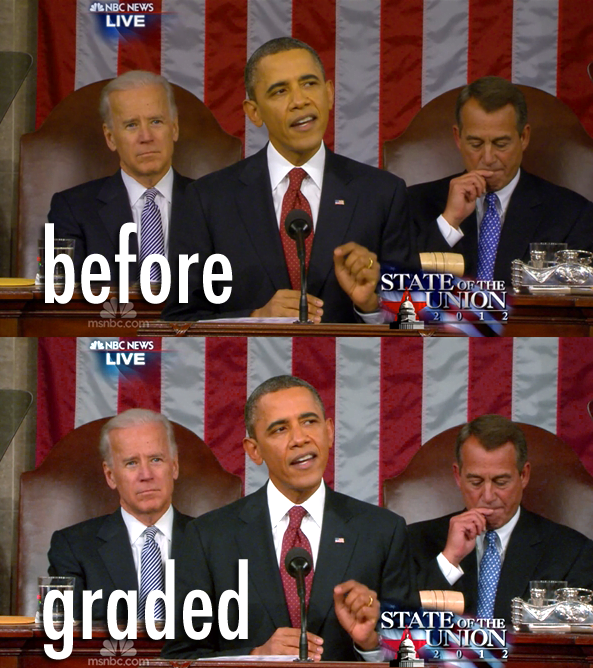 Making the (Color) Grade | Rewatchable, Inc.
One of the most important – and most often overlooked – components of video is color correction, or color grading, and last night’s State of the Union Address offers an unprecedented example of what poor color grading can do to reduce the quality of video. During last night’s telecast, the primary camera feed was badly discolored. Note how President Barack Obama (center) appears yellowish-green, and House Speaker John Boehner (right), a man with famously orange, tanned skin appears to have normal skin tone. The problem didn’t seem to exist from any other camera angles, and appeared across all of the television networks (although it looked like CBS was attempting to compensate in the second hour), and so was likely the result of incorrect white balance in that one camera. For whatever reason (probably security), adjustments couldn’t be made live, and the capability must not have existed in the control room to adjust the image before it was sent out to the networks, and so the result was an evening with a president that looked like a nauseous Kermit the Frog. So how does this relate to corporate video? Well, in the world of non-live video, we have the ability to fix and enhance these images after the fact using color-correction filters and specialty software. Most offices use some form of fluorescent light (or worse, mixed light), which can leave untreated images discolored similarly to the State of the Union. Light-skinned subjects appear to have a yellow cast, and dark-skinned ones look green. Getting good white balance during your shoot is key, but simple adjustment to a set of three color wheels can fix – even enhance – your images to return your subjects to their natural color so that viewers aren’t distracted and clients aren’t offended by the way they look. Take a look at the before and after picture with this post. If Barack Obama were your CEO, would you rather deliver corporate video that looked like the top image or the bottom? It took less than two minutes to grade the bottom image, and the difference in quality is night and day. Color correction is one of the easiest and most effective ways to add production value to your corporate video, and it’s fairly easy to get the hang of. Most people don’t even realize color correction exists, let alone what a drastic difference it makes in quality. You put it in accessible and easy to understand terms.